Stores reference 22c/892. Second pattern chromium plated metal 'lever' used to operate the CO2 cartridge within the stole (bladder) of the Mae West. 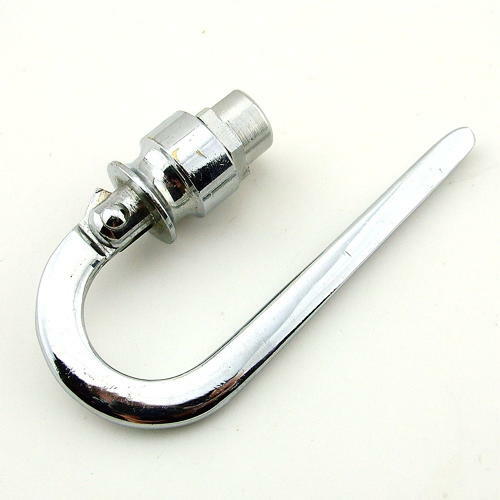 The inflation lever consists of a 'J' shaped handle that pivots between lugs on the lever body, a locknut, and an adaptor, or sleeve, with a cutaway skirt. The CO2 cylinder is screwed into this assembly and secured within the stole using a hose/worm clip around the base of the lever assembly (available on this site separately). Minor tarnishing otherwise in excellent condition. These levers also fit stoles fitted within Irvin/GQ harnessuits etc. Stock code MW22157.